If I turn back time to 2006 when Harry was born, I really wouldn't recognise myself. Aged just 22 and with no parenting experience at all (I hadn't changed a single nappy), it's fair to say I was a little out of my depth. During that first pregnancy, I would spend hours online reading everything I could about babies and parenting from how to correctly fill a baby bath to weaning methods and crib mattress ratings. I think I purchased around 8 pregnancy books. Yikes! Fast forward to December 2010 when Jack (baby no3) was born and things really couldn't have been more different. It's amazing what 4 years and a bit of 'on the job' experience can do! So today I thought I would take a bit of a tongue in cheek look at how my parenting style has changed over the years. I'm sure parents of multiple children will recognise themselves in a few of these. As mentioned, with baby no1 I bought around 8 pregnancy and parenting books. There wasn't a thing I didn't know about the stage of pregnancy I was at or the latest birth techniques. Of course I bought myself a full pregnancy wardrobe and followed the advice from my midwife to the letter. I wrote a birth plan and had strong ideas about the kind of birth I wanted. I spent 4 days in hospital which I hated and I always regret that I didn't have the confidence to get the sort of after-care I needed. For those that don't know, baby no2 (Heidi) was unexpectedly born at home with just Steve there to catch! So by the time baby no3 came along, I was prepared for anything. There was definitely no birth plan and I was just ready for whatever happened. I didn't re-read my pregnancy books and to be honest most of the time I forgot how many weeks pregnant I was and would just hazard a guess. When you are pregnant and looking after a one year old and three year old, you don't have time for such things. Jack's birth was my most difficult labour (he was back to back) but I'm pleased that I had the confidence to push for a 3 hour discharge from hospital as I knew we'd be happier at home and it was right for us. I always smile to myself when I look back at my time with Harry as a baby. I think I was borderline neurotic! I had a schedule for everything and made sure everyone would stick to it. I knew exactly what time his nappy would be changed (and even by who - haha), I wouldn't let anyone come within 10 metres of him with a mobile phone and I always made sure he had the best of everything - there is no way you would have caught me buying nappies from Aldi back then! Fast forward four years and I was a very different parent with Jack. I was very laid back and just went with the flow. I had nursery and school drops offs to juggle with nap time and it was far easier for Jack to just fall into our routine than for us to try and create any sort of routine for him. By then, social media had been invented too and lets just say I wasn't so paranoid about him being near a mobile phone. We bought Harry a whole new wardrobe before he was even born and he was always wearing cute dungarees and beautiful outfits from Next. By the time Jack came along though I had learned a very important lesson - buy baby clothes that are super easy to wash and dry. Cotton babygrows and jogging style bottoms all the way for Jack - I seriously did not have time to iron anything so clothes that I could tumble dry without ironing were the way forward. You will also notice by the time baby No3 comes along that you won't receive as many gifts and there definitely isn't a baby shower as you've kind of been there and done that. Harry had every piece of baby equipment going from a baby bath to bath thermometer, bottle warmer, nappy dispenser, top and tail bowl......you name it, he had it. By the time Jack was born I had learned another valuable lesson - you don't actually need all of this stuff. A normal bath is fine (and actually easier), you don't need a specific top and tail bowl and you certainly don't need a special machine that will dispense nappies. Plus, by the time you're onto baby no 3 you are definitely feeling the pinch on the purse strings and probably can't afford to buy all of these non-essentials again anyway and your priorities for spending money have certainly changed. Harry was weaned at 4 month (as per guidelines at the time). I would puree my own food and buy him Organic baby food. It was a stict routine of milk and weaning and I felt as if he always had something in his mouth! By the time Jack was born, baby led weaning was all the rage and I tried that. It was a far more relaxed approach - not really starting until 6 months old and just giving him some of our food when we ate. It was so much easier this way. Incredibly easy in fact. I didn't need to give any thought or put any time into time into baby meal prepping. He just ate when we did - it really was that simple. Anyone reading this might be thinking poor baby no3 - they seem to get a bad deal and are perhaps are a bit neglected. But as any second/third time parent will tell you, that's not it at all. With baby no 1 it is your first time going through pregnancy and birth and you listen to the advice from the 'experts' as that's all you know. By the time it comes to baby no3 you are older, wiser and more experienced. You know that it really doesn't matter if your baby wears Aldi nappies and doesn't have a wardrobe to rival Prince George. 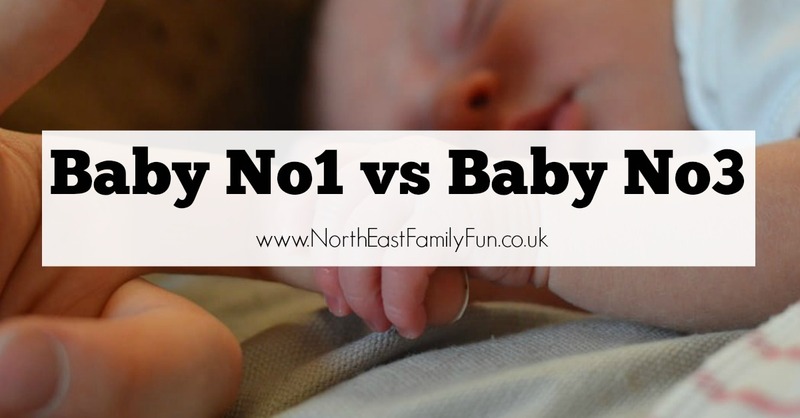 By baby no3 you have the confidence and experience to realise that as long as a baby is well-loved and cared for, they'll thrive. Nothing else matters. You are also more relaxed and able to make the most of your time with your baby without so much worry too. I'd love to hear if you have also changed your parenting style as you've had more children. Let me know in comments. My style has changed too. I'm not 3 kids in but I've definitely relaxed more. You just don't have the time to be neurotic do you! I used to antibac everything Arlo touched but Lena eats any old crap off the floor. I didn't know Heidi was an accidental home birth. Have you written your birth story for that? I'd love to read it. I love this post Sam and I'm only one kid in. But I was one of three and I was 6 when my sister was born so I watched how my parents looked after her. Obviously not from a parent point of view but I always remember how calm my Mam was and so confident in what she was doing. I think subconsciously that stuck with me. That plus my sisters all having babies before me helped me with my confidence with Ella. Granted I was still reading online about my pregnancy and tracking the weeks and progress. I think if I'd been first out of my sisters and not surrounded by friends who'd had kids I would have been obsessed with buying everything new and having all the gadgets. I was obsessed to a degree with feeding and nappy changes when she was born (I downloaded an app 😂 to log them on for two months. I sharp stopped that). I'd seen what happened to my sister's so although Ella was baby number one to me - she was number five in the family and got all the hand me downs etc. Otherwise we may well have spent a fortune on stuff we didn't need.